2014-06-30 Revelstoke, British Columbia - C U on the Road! 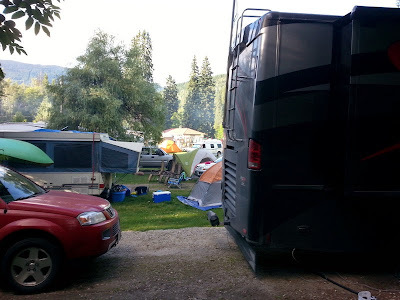 After a beautiful drive from Radium Hot Springs through Glacier National Park (Canada) and Revelstoke Mountain National Park we arrive at the Williamson Lake City campground. With the Canada Day long weekend coming up we were lucky and got the last site in the small park. It was crowded but everyone seemed to have a good time! Revelstoke Mountain has a road that goes almost to the summit. Unfortunately, it was still snowed in at the top. We still had great views of the town. 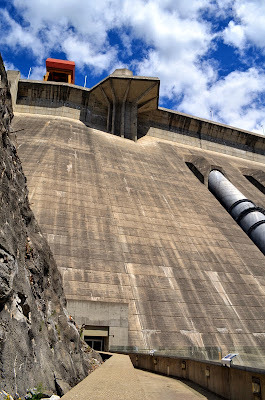 Revelstoke Dam with a museum and self guided tour. 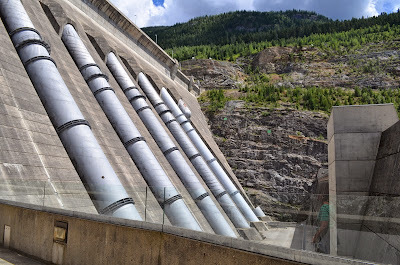 It's the largest dam in the BC Hydro system. Fun Fact: The Columbia River is the 4th largest river in North America and generates more electricity than any other one.